Nate Sudfeld was lights out in the Eagles' second preseason game. It's the preseason. 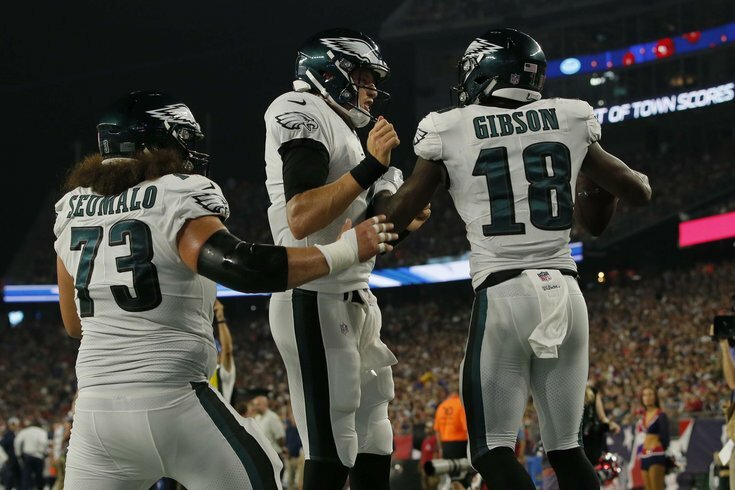 For every misstep Thursday night in the Eagles lackluster 37-20 loss to the Patriots there was a mitigating factor. Nick Foles got no pass protection. The personal foul penalties for lowering the head are new and require adjusting. Tom Brady was facing a lot of back up defenders. It's just the preseason. So the product on the field can't really be interpreted without grains of salt. Sudfeld looked a lot better than Foles, throwing three touchdown passes including a gorgeous lobbed over-the-shoulder pass to Richard Rodgers and a bomb to Rashard Davis for 31-yards in the third. Though far from perfect, Eagles fans were privy to a lot of the reasons why the Birds see him as a foundational part of their quarterbacks room. Should Foles and Wentz each be unable to play for some reason, Sudfeld appears to have the ability to be better than average under center. In three or so quarters of action, the QB went 22-for-39 for 312 yards, moved fluidly in the pocket and threw even more passes that hit receivers hands and then the turf — or a tipped pass interception on a pass to Matt Jones that wasn't at all Sudfeld's fault. It looks like the Eagles may have found their kick returner. Gibson's 46-yard return in first flashed his speed and was one of few bright spots in an ugly first half. Until, of course, the second-year wide receiver snatched a Nate Sudfeld toss in the end zone for Philly's first touchdown. His play of late has him as a near shoo-in for a 53-man roster spot. In all, Gibson hauled in five passes for 90 yards and the score. On two deep throws by Brady in the first quarter, Darby nearly had two interceptions as he deflected passes in shutdown corner fashion. If there was any doubt as to who Philly's top corner is, Darby flexed his coverage muscles Thursday night. To a lesser degree, Avante Maddox and Sidney Jones showed flashes of brilliance as well over a longer stretch of play — but were less consistent and showed signs of rookie inexperience. The first unit — led by Nick Foles — did not look sharp in its first series. Two incomplete passes, neither on target bookended a negative run for Jay Ajayi that led to a Cameron Johnston punt. A false start on their second possession followed by a wide-open drop by Kamar Aiken didn't do much to ingratiate confidence, and by the time Foles was sacked on third down, it was clear the Pats defense was charged up to face the defending champions (holding them to minus-6 yards in their first two series). The second sack of Foles ended his third trek down the field and a strip sack on his fourth ended his time under center. A unit expected to be one of the best in football, mostly intact Thursday, was absolutely ripped to shreds by Tom Brady, as the Birds committed a pair of costly penalties (including a personal foul on Rodney McLeod for lowering his head) and Chris Hogan scored an easy touchdown to open a 7-0 lead early. The Birds' other starting safety Malcolm Jenkins was flagged for a roughing penalty when the Patriots had the ball for their second possession, but the rest of the secondary and pass rush was able to step it up to force a punt. We thought about grouping Foles with the first-team offense, but after he was stripped in the second quarter and the Patriots returned the fumble for a touchdown, the Super Bowl MVP — who left the game with a shoulder injury on the play — is worthy of his own section. In all, an ugly evening for Foles saw him go just 3-for-9 for 44 yards with three sacks and a fumble.